The frequency in which your sewer lines are used on a day-to-day basis makes it easy for clogs to form. Clog formations can be attributed to any number of reasons, including grease, tree root clumps, hair, or food particles. While the symptoms of a slow drain or pungent smells may seem harmless, allowing these problems to remain in the sewer lines will allow them to grow and create more hazardous, expensive damage later on. These clogs have the potential to burst the pipe if they become too large, or create massive cracks and leaks. When these problems occur, you need experts to repair the problem. At Rooter Drain Experts, we employ trenchless pipe lining, an eco-friendly, safe method that will restore your sewer lines without trenches or other forms of property damage. With over twenty years of experience in the industry and equipped with the latest advancements in technology and machinery, we have the knowledge and tools required to restore your pipes without delay, and we are proud to offer our expertise to our customers in the Simi Valley community. Trenchless sewer pipe lining is an incredibly versatile repair method because it requires no excavation or having the water services shut off. This process can be applied to fix a number of different pipeline materials, including PCV and Orangeburg, increasing its popularity as an affordable and effective solution. First, our experts will conduct a sewer camera inspection to determine what the issue may be. This allows our technicians to see a live feed video of what is going on inside of your pipe and will ensure that you are never overcharged for services you do not need. Pressurized water will then be used to clean the pipe in a process called hydro jetting. This is the most effective way to clean pipes since it will not further damage them like chemical cleaners do. A deflated liner covered with epoxy resin will then be inserted and inflated inside of your pipe. The resin will coat the pipe and form a brand-new pipe inside your damaged, existing one. Once cured, this new pipe will be as strong if not stronger than PVC pipe and will have a lifespan of fifty years. With its smooth texture and seamless installation, clogs will not be able to form, and the chances of buildup accumulating along the walls and reducing the diameter is significantly reduced as a result. 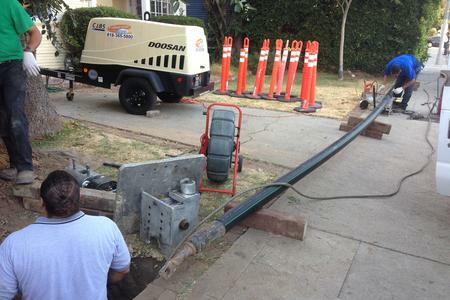 Trenchless sewer pipe lining is the best solution in sewer repair since it only requires a small access point. Traditional dig and replace methods require a large amount of excavation to remove the entire pipe, leaving large trenches in your yard that you will then be responsible for repairing. Trenchless pipe lining is also more environmentally friendly since it does not involve throwing away the old pipe but using the existing one to make a stronger, longer lasting pipe to suit your needs. We value your time and money and do not believe you should ever be paying for services not required. Trenchless pipe lining will save you money in the long run since it will fix your problem and offer a long-term solution while also preventing extensive damage from plaguing your property like the traditional dig-and-replace method does. For more information regarding trenchless sewer pipe lining or our drain cleaning services in the Simi Valley region, call The Rooter Drain Experts and we look forward to assisting you.